Free Guide #3, Available Now– Co-produced with Content-Object. Click to download a pdf of the guide LlanoAntagGuide though the real is much finer and free to (read on to learn how to get free print copy). An Antagonist’s Guide To the Assholes Of Los Angeles traces a history, theory, and sites for creative agonistic social and political practice in LA. The guide annotates over 80 places; banks, businesses, politicians and polluters, war contractors, institutions, a troll, a yeller, and a cruel mis-dial. The list was sourced through an open public call and research. The guide frames for its users sites worthy of creative exploration throughout Los Angeles. We hope your practice benefits from it. The guide also includes short essays framing antagonism within Los Angeles’ social and cultural history; contributions by The Llano Del Rio Collective, Marisa Jahn, Lisa Anne Auerbach, Laura Pullido, and Jennifer Flores Sternad. The guide is available for free to all residents of LA County. Guides may be found at designated locations, or may be requested (by county residents) by post by contacting llanodelrio@gmail.com while they last. Anyone can purchse a guide by contacting Half Letter Press . 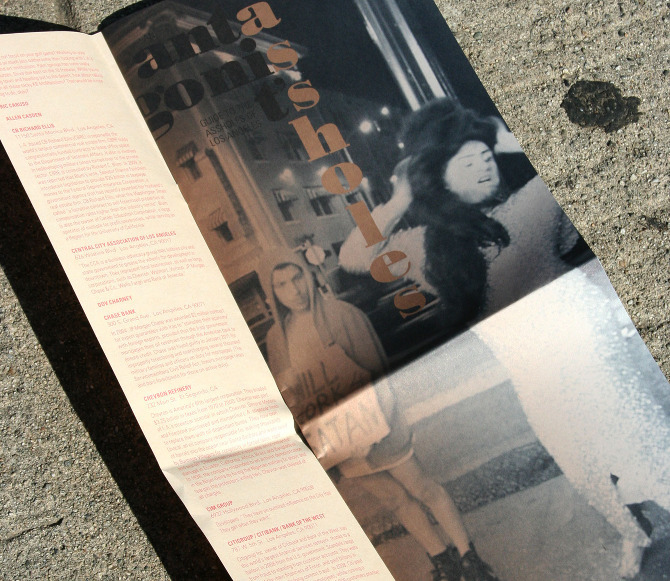 An Antagonist’s Guide to the Assholes In LA is the 3rd free map/guide to Los Angeles by the Llano Del Rio Collective. Past guides are A Map For An Other LA (sites of collectivist projects) and Scores For The City (locations for aberrant public behavior). i am SO glad to see the CCA on your list.